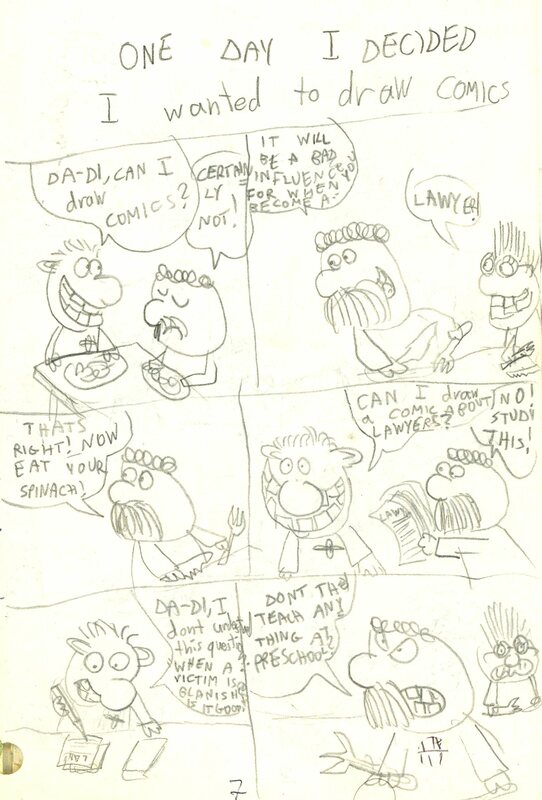 Again from Yerp Magazine‘s second anniversary special issue from 1989, here is a comic I drew at age 10 recounting the moment I announced to my parents that I wanted to become a comics artist. For the record, neither of my parents ever expressed any desire that I become a lawyer. 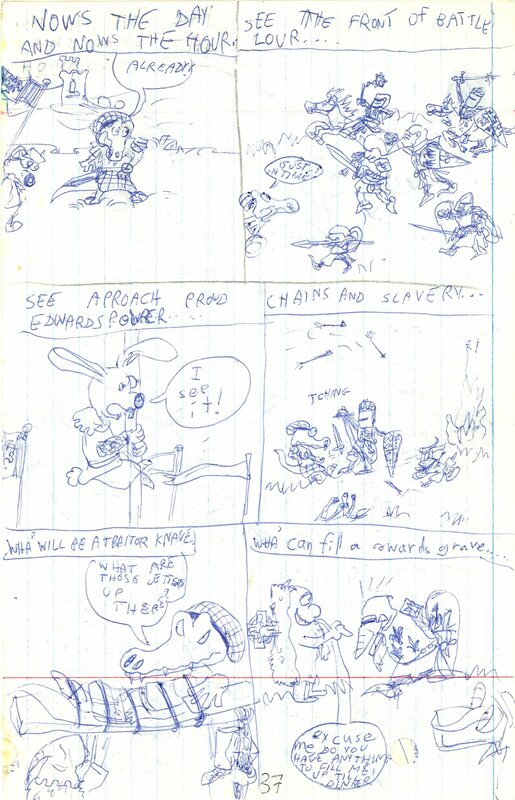 I had a weird sense of humour (back then). It has been found! 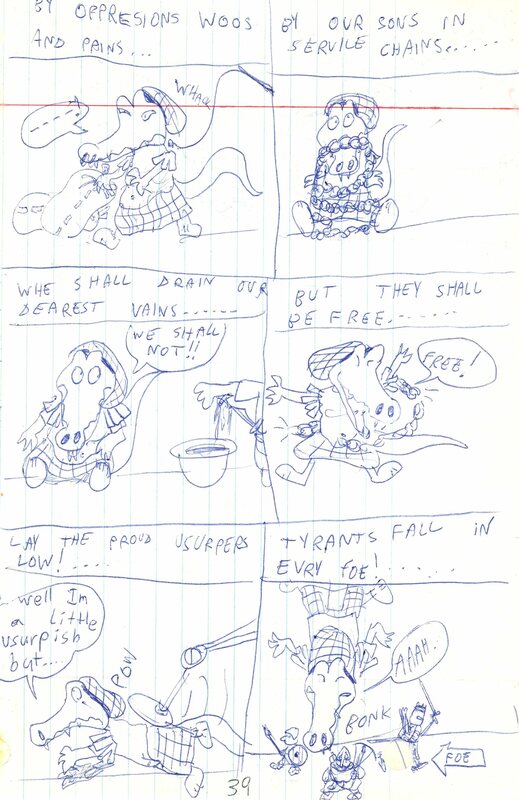 Here is my very first comics adaptation of a work of classic poetry, created in 1989, when I was ten years old. 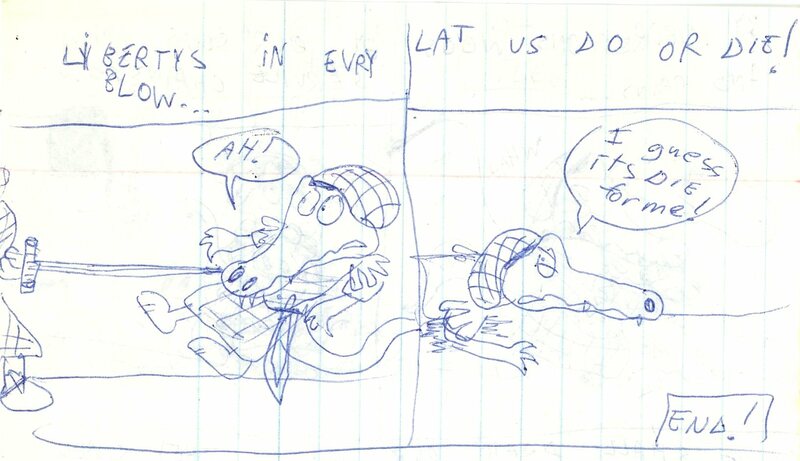 It features Yerp the crocodile, the star of almost all my comics from those years. 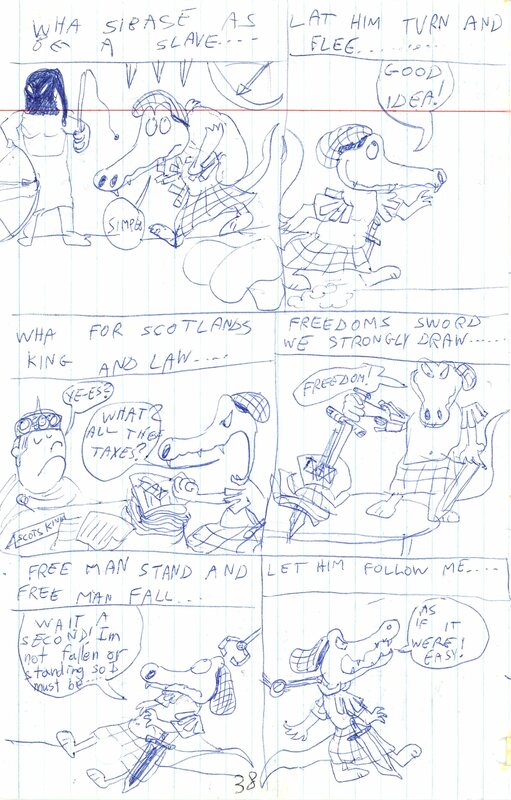 The poem, written by Robbie Burns in 1793, imagines a speech given by Robert the Bruce, King of the Scots, to his soldiers before the Battle of Bannockburn (1314). The Scots won a resounding victory against the invading English forces of Edward II, thus avenging William Wallace (of Braveheart fame). 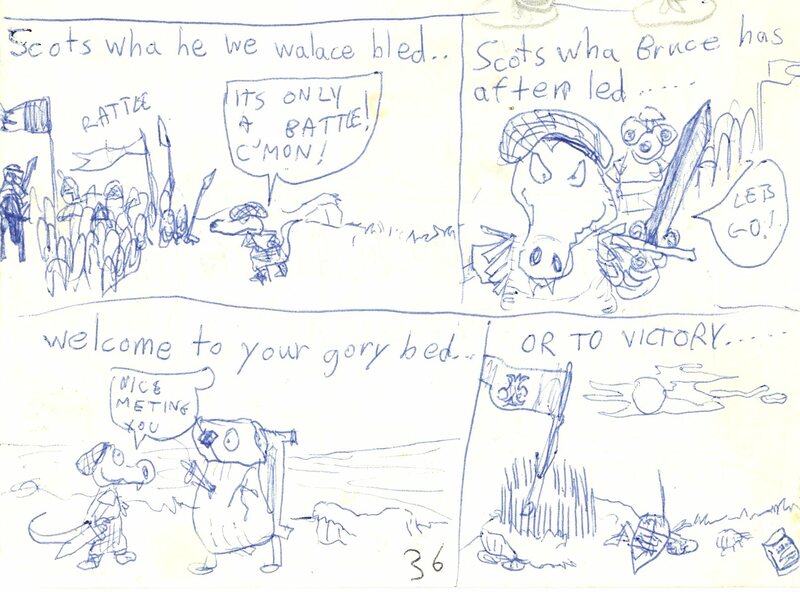 Yerp’s reactions to Burns’s stirring lines may seem somewhat defeatist, but I like to think they reflect a nascent form of the pacifism that has always accompanied my lifelong fascination with military history. 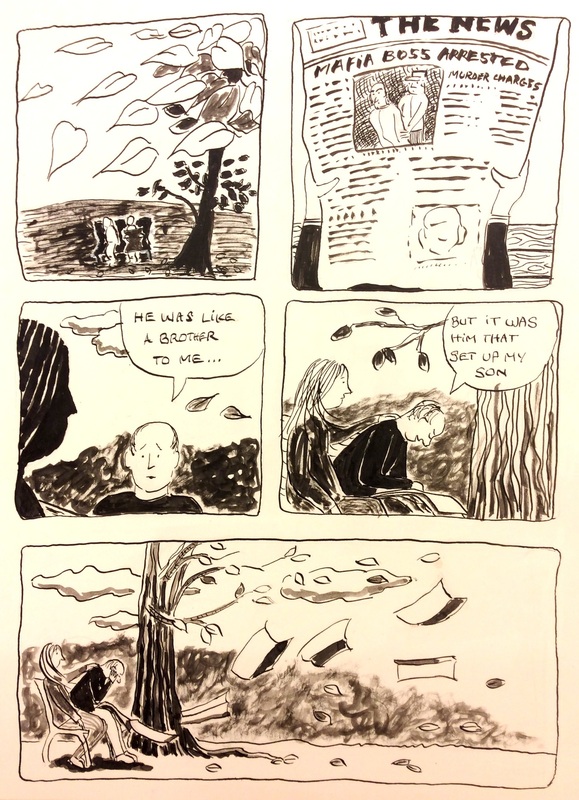 I haven’t been posting much new work these last couple of months, mostly because I’ve been teaching at four different school this semester and have had time for little else (I have, however, been doing a fair bit of doodling, as attested by my Instagram account @julianpeterscomics). 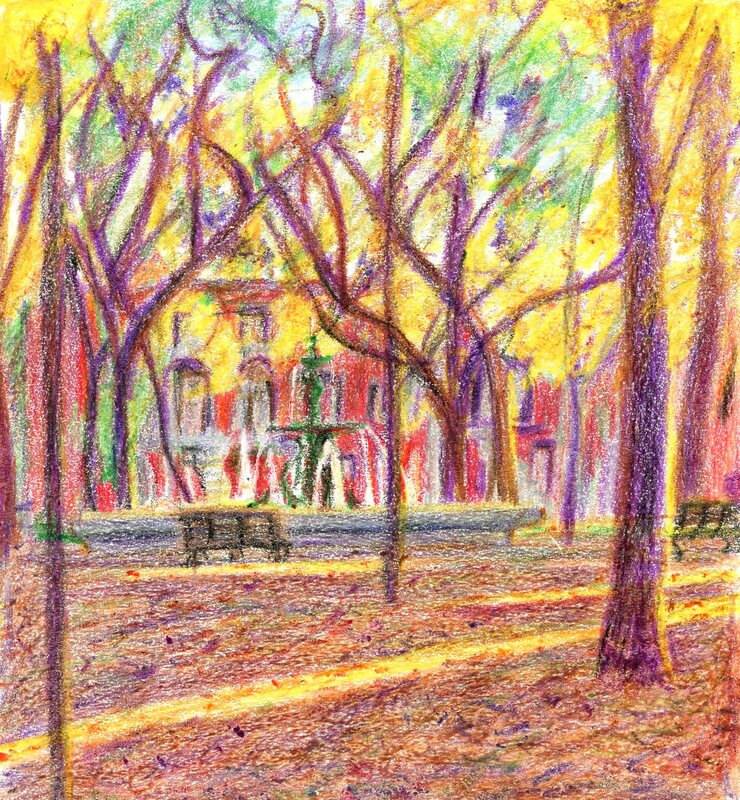 Before winter rather abruptly and definitively set in here in Montreal in early November, I did find a few free afternoons to go out and do some urban sketching, using a material that was quite new for me (at least in adult life) -crayola crayons. 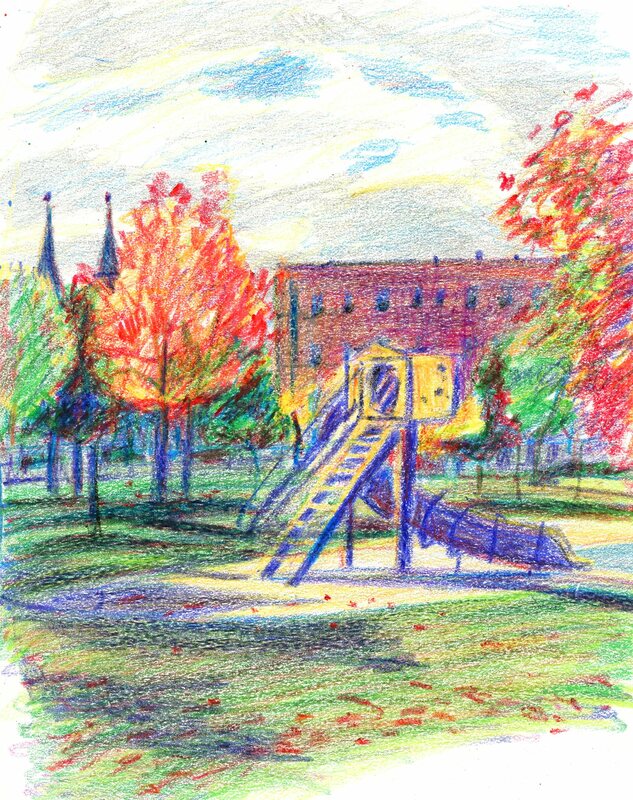 The bright, primary colours seemed to suit the Montreal fall light, which is very clear and almost naively unfiltered, and the wax crayons also have the advantage of being eminently portable. 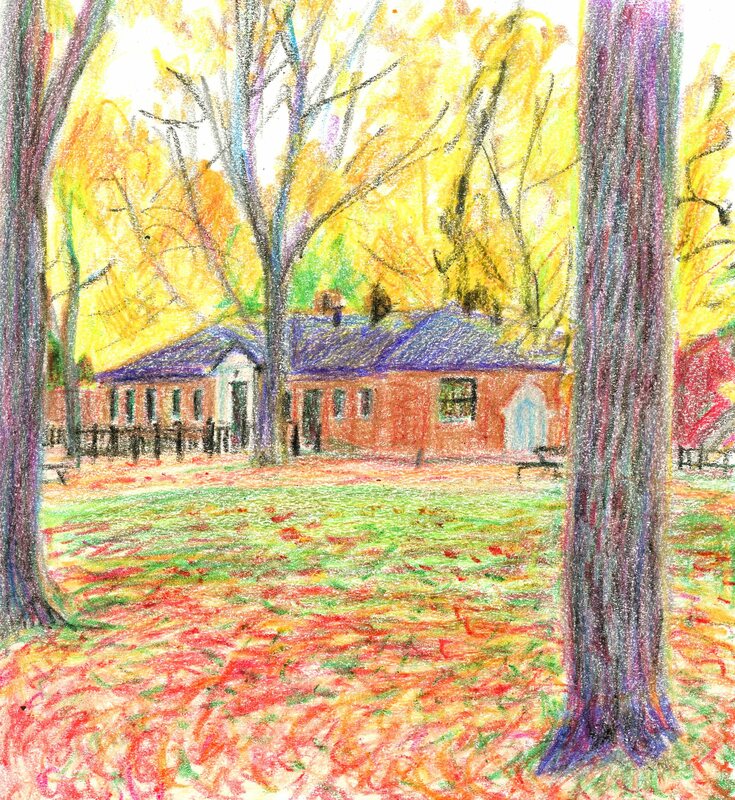 Unfortunately I only got to do a few of these before the days got too wet and cold (not to mention colourless) to permit outdoor drawing, but I hope to get back to this kind of thing in the far-off spring. During the course of the interview talk I present four songs that hold a special significance for me and how I connect them to different moments in my life. Which four songs? the answer may surprise you! 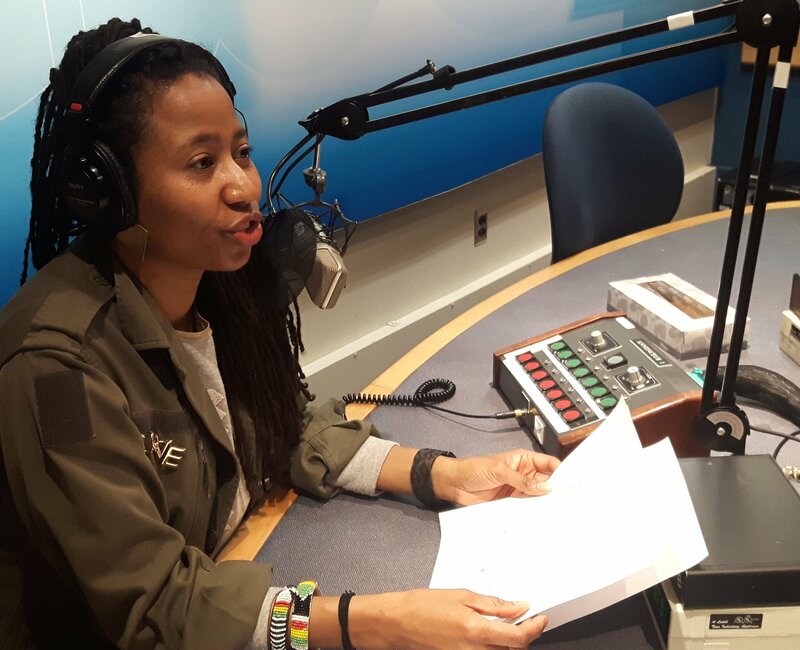 A couple of weeks ago I was interviewed by Nantali Indongo for CBC Montreal’s arts and radio program The Bridge. 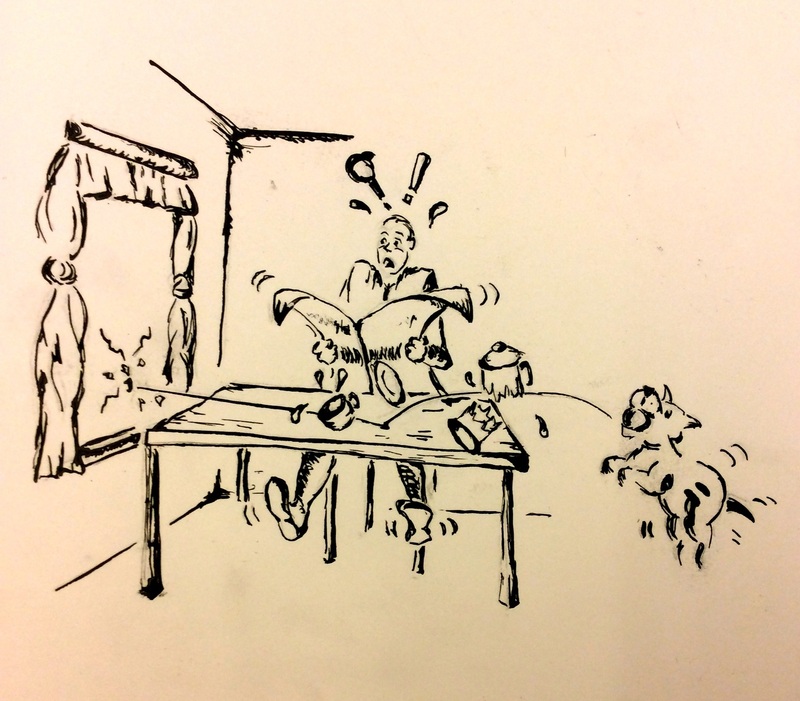 In addition to discussing my comics projects and the relationship between poetry and comics, I will talk about four songs that hold a special significance for me and how I connect them to different moments in my life. The interview is just under an hour long and runs tomorrow, Saturday, at 5pm EST, on CBC Radio (88.5 FM). Nantali is a great interviewer, and there were a couple of questions that really got me thinking -next time they come up I’ll have better answers!